Thanks to Eddie at Vid-Atlantic, I got to try the CineMorph mod filter that fits the Sigma 18-35mm f/1.8 ART. The results are addictive, with wide angle, extreme close up anamorphic character. I love it! This CineMorph takes anamorfaking to the next level by quickly taking over a superb, fast, constant aperture, zoom lens: the Sigma 18-35mm f/1.8 ART. No crazy steps and taking stuff apart, installation is pretty simple, the price is cheap, and the results are outstanding. The insert is a thin 3d-print in black plastic. It slots neatly into place and I didn’t even know you could reliably 3d-print something so thin! Be aware that if you pick a version with flares, you’ll have a line going across bokeh. Most people won’t notice it, but you’ll know it’s there. It’s good to remember this thing is also compatible with other Sigma and Zeiss Distagon lenses in Canon EF mount and not other lenses because of the three screws at the back. I’ll get to that in a second. CineMorph filters are always available! You can grab yours at Vid-Atlantic’s website. The basic option – just the oval – is $35, then $45 for neutral flares and $50 for tinted flares. The one I’m using here has neutral flares. The rear CineMorph is very easy to install. You can find the steps at Vid-Atlantic’s website AND on a small leaflet that comes with the filter. First, loosen these three screws on the back of the lens. Do not take them out! Slide over the filter and rotate it to align. Last, tighten the screws back into place. Do not overtighten. As a safety warning, the folks at Vid-Atlantic inform that this rear filter might not be compatible with every single Speedbooster, adapter and attachment out there. For more detailed disclaimers, check their product page. I was able to use it with the Metabones Smart Adapter from EF to E-mount without a hitch until the very last test, when it got caught up on the mount and tiny corner broke off. Make your own tests to certify if you’re clear or not! Eddie also said that if you experience problems, they’ll send you a replacement, and the filters are fragile so if something breaks, it’s the filter and not the expensive adapter or lens! I should begin by saying that this is an APS-C lens, which doesn’t cover full frame. Other than that, there are no issues with vignetting, at any focal length. As you’re placing an obstruction in the light path, some of it is lost. Around one stop, to be accurate. The lens will now behave as f/2.8, even though the aperture is at f/1.8. You also will want to rely on NDs rather than stopping the lens down, as you’ll start to get heavy vignetting on the corners past f/3.5 at 18mm. It was so easy and straightforward to use this mod that now I regret I have to ship this Sigma back… If you have this lens, I highly recommend this attachment. It’s a great way to fake anamorphic bokeh and flares for wide shots with shallow depth of field – the hardest type to achieve when using adapters! Stay tuned for the next episode which will cover all other versions of the CineMorph; these are the ones that go in front of your lens – or your mattebox! If I wasn’t clear enough I meant: SUBSCRIBE. NOW. I have a few other videos on anamorfaking and you can find them in this playlist. Lastly, this project needs support. Join me on Patreon for exclusive rewards, inside information and the power to vote on what comes next! Ferradans, out! What should you expect from this channel in 2017? Time to answer those questions and open up for input! Share your thoughts on the comments below! Heya, Tito Ferradans here for a lighter video this week. Doing this holiday season push was intense and I needed a little break to organize what’s coming this year. Then I thought of sharing my plans with you, and here we are. First of all, I’d like to thank my buddies on Patreon that are giving me a great help. Our discussions already shaped many of the things here, so, if you wanna be a part, join us! Ok, so here’s the round-up: in the early months of this year I’ll have reviews up for the Sankor 16D, Kowa 8Z, Vistascope 8mm, and the AnamorphX GP. I’ll squeeze the Isco Ultra Star here too. I’ve been chatting with Eddie at Vid-Atlantic and I’ll try all flavors of Cinemorph filters – which are another alternative for anamorfaking, easier than lens modding. I’m still pending the shortfilm part of the Single Focus Shootout, so we’ll have that coming up too. It’ll be a thrilling ride, more elaborate than the previous shootout. Then, since I got a Kowa 8Z, I can compare it to the 16H and B&H to try to clarify what are the differences between these models that are always switching places at the top of the rankings. On the collaboration side, I’m chatting with Mikalai Verbel, who’s working on the Verbascope and that leads to an episode of intense modifications to adapt the massive LOMO NAP – a number one hit when it comes to low-budget anamorphic. I’m also collaborating with the endless pool of information that is James Price and working out an episode about mounting rails on scopes; enough with the train of lenses (as coined by Alan at Vintage Lenses For Video). As long-term goals, I have my sights on the Rectilux CoreDNA that everyone keeps talking about. I’m also trying to get my hands on SLR Magic’s Anamorphic Primes. And, of course, a proper video to talk about the recently announced Panasonic GH5. Besides the videos, this is a great year to update the blog, to make the Anamorphic on a Budget page cleaner and more organized overall. I’m also revising the original guide for better English and updating some concepts. It’s my way to get a grasp of what needs to be covered in the upcoming Cookbook. The calculator still has updates I want to implement – mainly to help you see changes in setup through the lens – and there’s the magical dream of being able to recreate very specific lens distortions in post through a (dream with me) custom built After Effects plugin. If you try to count everything I named, you’ll notice that’s a ton of episodes. I wanna clear enough technical ground and start going for the philosophical stuff after the first half of the year, like “Why shooting anamorphic?” and “Why does bokeh become oval?”, “How do diopters work?”, “Cinemascope storytelling” and so forth. What do you think? Am I missing something very important? Leave a comment below, let’s chat! If you like these plans, be sure to subscribe here and support on Patreon. I’m Tito Ferradans, and I’m exhausted even before we begin. See you next week! The upgraded version for the mumps correction tutorial I posted last year. Featuring a free AE preset that will let you apply the adjustment directly to video! This episode was made in collaboration with Lucas Pfaff. Tito Ferradans here with a new post-processing tool. Today’s episode is about AMC, the Anamorphic Mumps Corrector, a simple After Effects preset that can help you fix those pesky mumps. All you need is some eyeballing skills: play with the Amount and the Curvature sliders to achieve the desired effect and hit render! After last year’s tutorial on how to correct mumps, I got intense feedback from people that loved the effect. They also said it was completely impractical. A few weeks ago, Lucas Pfaff and I started to talk about an easier way of achieving a similar effect directly in a video application. AMC was born. Before you start, place AMC in the right folder. For Windows users, go to C:/Program Files/Adobe/After Effects <version>/Support Files/Plug-ins or /Presets and past the AMC.ffx file in there. For Mac users, drop it at Applications/Adobe After Effects <version>/Plugins or /Presets. Now open After Effects and you can find AMC in the Effects and Presets tab, in the Animation Presets folder. The preset is a combination of native effects and controllers rigged with expressions. Bezier Warp is the base, but that is pretty useless by itself. What Lucas and I did was connect it to controllers so it fits any comp size. I’ll demonstrate first on a checkerboard, then on footage. Amount controls how much distortion will be applied. Positive values compress the middle, negative values compress the edges. The Curvature slider creates/counters barrel distortion. Positive values bulge inwards, negative values go outwards. Set it to zero and your warp will be completely straight. Curvature_CTRL affect the distortion’s intensity. The advantages of this method over the previous one are beyond obvious, with much easier controls, faster feedback for adjustments and easier to apply to video. I’m constantly trying to come up with useful tools and tutorials. You’ll help a lot by just liking and sharing this video. Now, before you go to the blog to download AMC, make sure to subscribe and to check Lucas’ reviews! I’m Tito Ferradans and I’ll see you next week. The ultimate comparison between Single Focus Solutions for Double Focus Anamorphic Lenses. Rectilux vs Rangefinder vs FM Lens. All charts can be downloaded at the blog, check the link below. Tito Ferradans here for the clash! The episode everyone has been waiting for! 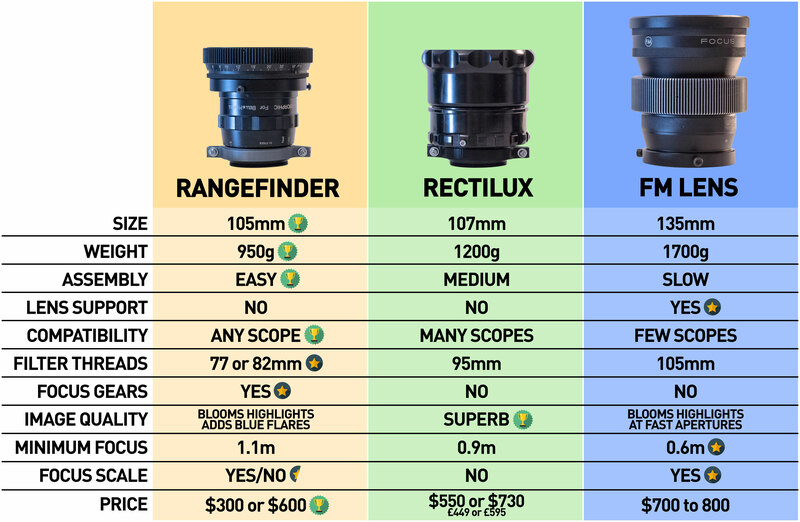 Rectilux, thought to be the sharpest and most neutral option, vs Rangefinder, the smallest and cheapest alternative, vs FM Lens, the first product to be released on the market! It’s time to make up your mind about which solution to buy. Head to head comparisons ahead! Who’s the ultimate winner? Brief review: these three are the key single focus solutions for double focus anamorphic adapters. You attach your anamorphic to one of these, focused to infinity, focus your taking lens to infinity and go shoot happily ever after. They work through a variable-strength diopter. To understand what that is, check my post about it. The categories are Dimensions, Assembly, Compatibility, Image Quality and Price. Comparisons will be objective. If, at any point you want more info about a specific lens, watch its individual review. All the charts and tests can be downloaded at full resolution for your own inspection. Size matters. Size matters a lot! There is no argument here that the Rangefinder owns this category, with 950g (considering the anamorphic and clamps), followed by the Rectilux at 1200g and then the FM with 1700g. Assembly is about how complex it is to mount the anamorphic to the variable diopter and mount that to the taking lens. Again, another easy category for the Rangefinder. Just screw it to the front clamp and then the back clamp to the taking lens. Both the Rectilux and FM require some disassembly of the anamorphic adapted and have a couple more steps until successfully mounted (assembly guide for the Rectilux and for the FM Lens). The Rectilux has a different clamp for each anamorphic. The FM might not even have filter threads depending on the anamorphic inside. I highly recommend lens support when using single focus solutions due to the added weight. The FM gets a star for being the only option that already comes with a solid support system. I made a clamp for the Rectilux that also works with the Rangefinder, but even in these cases, I have a second lens support in place to distribute the weight and ensure the adapters are not tipping down. Compatibility is the next category. Here we have close competition between the Rectilux and the Rangefinder as they can be paired with multiple scopes while the FM faces challenges with smaller and shorter scopes – unless you wanna cut it in half! The Rangefinder gets an edge because of its simplicity and takes its third category in a row. All you need is a clamp and you’re set. If you’re using multiple anamorphics, that’s an easy swap. The Rectilux requires specific mounting rings – which need to be purchased separately – for each anamorphic. Besides that, some adapters will fit inside the 3FF-S, while others inside the bigger 3FF-W. Still about compatibility, extra stars are awarded. The Rangefinder takes 82 or 77mm filters – which is good for NDs – versus 95mm for the Rectilux and 105mm for the FM. Another star goes for the focus gears. The Rangefinder has them by default. You can add gears to the FM and Rectilux at extra cost, from third-party manufacturers. Two categories to go, and I know these are the ones that matter the most. For image quality, here are the results and download link for the full resolution samples. Besides these charts, I’ve already shown that both the FM and Rangefinder bloom at faster apertures. The Rangefinder also adds some blue reflections to the flares. This crowns the Rectilux as the best performer. Adding to it, the FM gets a star for minimum focus, at 0.6m, opposed to 0.9m for the Rectilux and 1.1m for the Rangefinder. The FM gets a star for having a focus scale and the Rangefinder gets half of a star because some models have a focus scale and others don’t. The Rectilux has none. As for price, the Rangefinder will kick down its competitors with the budget version retailing for $300. The FM is no longer in production, but it used to go for $700 and the Rectilux tops the list at around $1000 – price has changed due to the £ fluctuations! (£449 for the 3FF-S, £595 for the 3FF-W). The score is four categories and two a half stars for the Rangefinder, one category for the Rectilux and zero categories plus three stars for the FM. If you want the most advantages for the least amount of money, the Rangefinder is your best shot. It will provide you with a lighter and smaller form factor, simplicity to set up, focus gears and the possibility of using filters more easily, all at a very low price. The trade-offs are issues at faster apertures and added flares. If performance is what you seek, go for the Rectilux, with the cleanest and sharpest images. You’ll spend more, but you’ll get better results too. Lastly, I want to address the Rectilux CoreDNA. I didn’t have a chance to try it yet, but it does improve several aspects of the 3FF version, making it more competitive against the Rangefinder. I guess this match is the next big thing I have to plan. Do you have a single focus solution or are you getting one soon? How do you like it? I love these things for fixing double focus and allowing easy use of many magnificent projection lenses. I have a short film coming up, mixing these three lenses, so you can try to spot the differences between them in a real-world test as opposed to charts only. If you’re into watching that, subscribe now and the video will pop in your feed soon. Also, if you want to watch each review individually, here they are, with much more info about the adapters Ferradans, out. Hey friends! I’m here today for a different subject. The subject of “I want to keep making these videos”, but I need your help. I started this channel in July of 2015, with the goal of bringing more information to the subject of anamorphic lenses and adapters. The anamorphic look is attractive, but there are plenty of strange practices and myths when shooting with scopes. If you’re new to the channel, I recommend going back through the archives: we’re talking about over 70 videos; one every week, with a wide variety among tutorials and reviews plus free custom parts for download. In the beginning I said “I won’t spend any money on this”, and “I’ll be using what I already have”. I was wrong. I constantly invested in upgrades to make better videos. The amount I spent last year just to keep it running was almost $800 – for improved sound, webhosting, software and occasional gear rentals. I haven’t gotten any of it back because all the content is available for free – and that’s how I plan to keep it. I can’t sustain these expenses, though and this is when Patreon comes in. Patreon is a platform where you can donate to content creators on a monthly basis. * – When I got their package for the Anamorphots and Rangefinder reviews I had to pay customs on it. ** – I rented those for the Rectilux review, before buying my own set. *** – I rented the Panasonic three times: for its own review, for the +0.25 diopter test, and for the 1.33x shootout. Then I bought one. Here’s some data: the average video takes me between eight to twelve hours to complete. That is researching, writing, shooting everything (myself speaking, lensporn or tutorial steps, charts and world test), editing and wrapping. All of that competes with school and work. I put four videos up every month and the money I get from YouTube is enough to pay me a salary of $0.60/hour. I’m sure you wouldn’t take a job with that description. The goal is to increase the amount of material I put out and the overall quality of the videos and articles. By that I mean not only video, but also written posts and tools (like the quick guide on how to buy your first anamorphic lens and the Anamorphic Calculator. I started to develop the Anamorphic Cookbook months ago and that has barely moved because I can’t afford to spend time on it! The reward system in Patreon is super cool as I can detail what’s the next step/upgrade to the project and I can have your input on what subject interests you the most. You should really check out the page to see how much I’m putting into it. In the past year I got plenty of messages and comments from you saying how much you appreciate the videos and that you’d like to offer some support. Here’s your chance! The Patreon money will go entirely towards this project. You can give as little as $1/month and sponsor the Anamorphic on a Budget series. If that’s not your thing, you can still help by subscribing, liking and sharing the videos. Keep this in mind while watching 2017’s first episode! I’m Tito Ferradans, and I’ll see you next week.